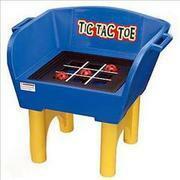 This is a perfect addition to any carnival or birthday party. Simply try to get a hole in one. Try to get the horse shoe around the peg. Try to get the rings around the pegs. 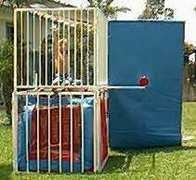 Balls float and child trys to shoot them down with nerf guns. Place the card in the machine and it spins while the child drops paint on the card making designs. Balls float up as the child hits into the baseball back stop. Child trys to throw the ball getting 3 in a row either horizontally or vertically. Try to knock all the tin cans over at once. 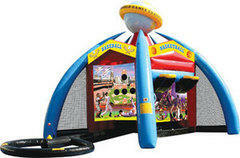 HUGE!30'x30' and can keep 100 kids busy This is 6 games in one. Basketball, frisbee, baseball, football, darts, and soccer.